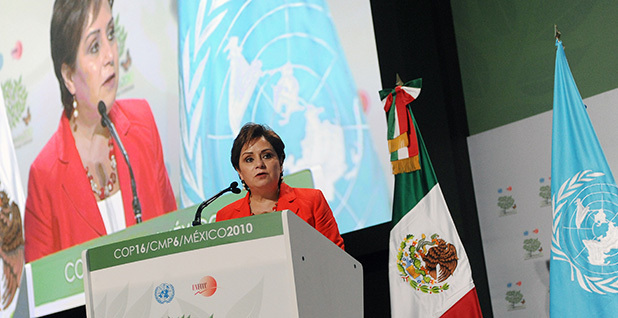 Mexico's former foreign affairs secretary, Patricia Espinosa, was widely credited with helping to resurrect the U.N. climate process from the Copenhagen doldrums when her country hosted a key summit in 2010. Now she's set to lead the climate body as it tries to make a global agreement struck in Paris last year a reality. Photo courtesy of the International Institute for Sustainable Development. A woman credited with helping to resurrect the U.N. climate change process after the disappointing outcome of the 2009 Copenhagen, Denmark, summit will be its newest leader, charged with making global promises struck last year a reality. Mexican diplomat Patricia Espinosa is expected to replace Christiana Figueres as executive secretary of the U.N. Framework Convention on Climate Change after Figueres departs this summer. Her nomination yesterday by U.N. Secretary-General Ban Ki-moon still requires approval by an 11-member body helmed by French Ecology Minister Ségolène Royal. That vote is expected on May 15. As Mexican secretary of foreign affairs in 2010, Espinosa presided over the U.N. climate meeting in Cancun -- a gathering that helped pick up the pieces after the failed summit in the Danish capital the previous year. The meeting in the Mexican resort town began to show that success was possible within the U.N. framework, observers say. "The success in Cancun in many ways set the stage for the success last year in Paris," said Elliot Diringer, executive vice president of the Center for Climate and Energy Solutions. "Really, under her leadership, Mexico did a masterful job of restoring confidence in the U.N. climate process after the Copenhagen debacle, and I think she managed the substance and the politics extremely well," he said. "Obviously, after Copenhagen, there was a lot of scar tissue, and she and her team spent the entire year talking to anyone and everyone about how it's going to be different," added Jake Schmidt, international climate director for the Natural Resources Defense Council. U.N. 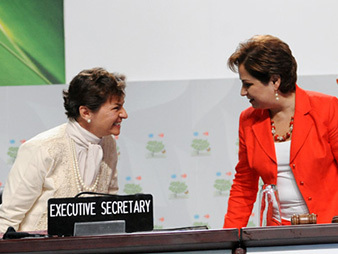 Framework Convention on Climate Change Executive Secretary Christiana Figueres (left) will pass the torch this year to Mexican diplomat Patricia Espinosa. Photo courtesy of the International Institute for Sustainable Development. Copenhagen failed to produce a looked-for climate deal, leading to widespread doubt that the United Nations could ever produce such an agreement. One of the most important lessons Espinosa and her team gleaned from watching that process fall apart, observers said, is that it's essential to include all players in the negotiations early on. The U.N. process works by consensus, and any country has wide latitude to gum up the works if it feels its concerns aren't being heard. The Danes were viewed to have excluded some participants at key points during the negotiations -- especially after the conference's president, Connie Hedegaard, was replaced by Prime Minister Lars Løkke Rasmussen while the negotiations were in progress. Laurence Blandford, director of international policy analysis at the Center for Clean Air Policy, said the feeling among many delegations in Copenhagen was that the Danish presidency was "trying to push the process too far too fast over the objections of countries." The late Venezuelan President Hugo Chávez was excluded from some leader-level dialogues. His top negotiator, Claudia Salerno, illustrated this sense of being excluded perhaps most vividly when she said she'd bloodied her palm trying to get the Danish Conference of the Parties president's attention after her requests to speak were repeatedly ignored. "That to me reads like a diplomatic error," said Blandford, himself a former Canadian negotiator. "If you feel from the outset that you're not even included, then there's a flaw in the process." But career diplomat Espinosa and her team circled the globe ahead of the Cancun meeting, engaging principal players like the United States and China but also smaller countries that had frequently obstructed the process, like Venezuela and Bolivia. "Usually, those groups, the potential blocking countries, don't get a lot of attention except in the actual meetings," said Schmidt. "She [Espinosa] actually spent a lot of time with them personally." Players knew that their concerns would be accommodated if that was possible. Blandford remembers that the presidency's final text in Cancun carefully avoided countries' "red-line" concerns. "They clearly had understood everybody's position and were extremely sensitive to that," he said. In the end, Bolivia still opposed the adoption of the Cancun Agreements at the close of the conference, but the country had few allies that wanted to see it deny the Mexican presidency a win. Espinosa gaveled down the agreement despite Bolivia's objections, earning a standing ovation from the plenary. Diringer credited Espinosa with understanding U.N. procedure intimately enough to know that if Bolivia pressed its objection, it would trigger a vote. That in turn would break down the process's reliance on consensus -- a result many parties might see as disadvantageous to them. It's a level of familiarity with the process that he said many previous presidents had lacked, and one that is likely to serve the new UNFCCC executive secretary. The agreements Espinosa helped produce codified the Copenhagen pledge that developed countries would raise $100 billion in climate finance for poor countries annually by 2020. They created the Green Climate Fund -- which was initially a Mexican idea -- and set countries on a path to make pre-2020 emissions cuts that would eventually pave the way for the post-2020 actions included in the Paris deal. Espinosa is seen to have had a hand in those achievements. "If you look back over the last several years, if you were to name one person who was a highly successful [Conference of the Parties] president, it was her," said Blandford. When Figueres announced her departure earlier this year, observers said they hoped the next UNFCCC leader would have a similar understanding of both developed and developing countries' priorities as the Costa Rican leader. Espinosa also strikes that balance, observers said yesterday. "Mexico occupies a somewhat unique position among parties," said Diringer. "It's one of the countries that kind of straddles developed and developing." The country is designated as a developing country but is not a member of the Group of 77 and China -- which represents the combined interests of the developing world within the talks. It is a member of the Organisation for Economic Co-operation and Development, which is seen broadly as a developed country club. This binary identity helped Mexico put forward the GCF -- which includes developed-country finance for poor countries but also provides standards for how that money should be used and an opening for voluntary contributions from developing countries. Espinosa, like Figueres, also represents Latin America -- a region with diverse positions in the U.N. climate process ranging from major developing nations like Brazil to deeply vulnerable countries like Figueres' Costa Rica that support aggressive action. "Espinosa and Figueres have sent an empowering message about the skillful leadership of women but also about the unique Latin American talent to build 'bridges' between big and small countries, developed and developing," said Monica Araya, a former Costa Rica negotiator and founder of the nonprofit group Nivela. "Having a second Latin American UNFCCC chief is an inspiring example for all, especially for the countless women working on climate issues around the world." Espinosa will take the reins of the Bonn, Germany-based secretariat as it begins the work of implementing the Paris Agreement, which looks increasingly likely to take effect next year, if not this year. Last month's blockbuster signing ceremony in New York City drew 175 countries, which took the first step toward entering the deal into force -- and countries representing nearly half of the world's emissions are likely to ratify the deal this year. That means a host of rulemakings, decisions and modalities are needed to ensure the agreement operates smoothly and increases ambition as the years progress. Blandford noted the secretariat doesn't set the agenda for negotiations but is tasked with making sure they stay on target -- something Espinosa proved in Cancun that she could do. "She can't give her opinion as much about things, but she can certainly communicate well around the process and really reach out to countries to keep them engaged and to keep them focused on forward motion," he said. "Patricia's leadership comes at a pivotal moment," Andrew Steer, president of the World Resources Institute, said in a statement. "The coming months will be critical to ensure rapid implementation of climate plans, setting the groundwork for even more ambition and an accelerated transition to a net zero-carbon economy and climate resilient future."